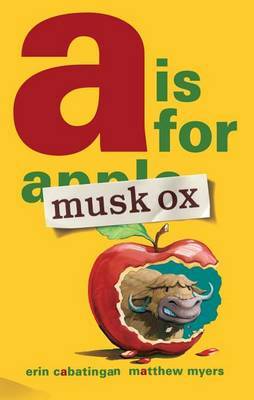 Musk Ox, a rambunctious anti-hero, literally chews through the cover of this anarchic alphabet book. Having eaten the apple that A was supposed to be for, he blithely inserts himself, claiming A is for Musk OxNbecause musk oxen are Awesome and live in the Arctic, which includes A... read full description below. Musk Ox, our rambunctious anti-hero, literally chews through the cover of this anarchic alphabet book. Having eaten the apple that A was supposed to be for, he blithely inserts himself, claiming A is for Musk Ox--because musk oxen are Awesome and live in the Arctic, which includes Alaska! Zebra, his nemesis, is less than thrilled. And so this cantankerous couple lead the reader on a romp through the alphabet with Musk Ox claiming every letter for himself, and Zebra doing his level best to keep him under control. Filled with Matthew Myers's hilarious artwork with lots of hidden details for kids to explore, this may be the funniest alphabet book ever created. T is for Erin Cabatingan because she has Three children, Two cats, and when she was eleven, a Telephone pole fell on her house. She and her family have lived all over the United States from California to New York to Hawaii and she looks forward to wherever life takes her next. A Is for Musk Ox is her first book. W is for Matthew Myers because he is constantly asking Why? almost as much as when he was a kid. Why do zebras wear neckties but not socks? Why is there a double-u but not a triple-u? Why would anyone clog dance on purpose? This is Matthew's second book for Roaring Brook Press. Matthew lives and works in Brooklyn, New York.